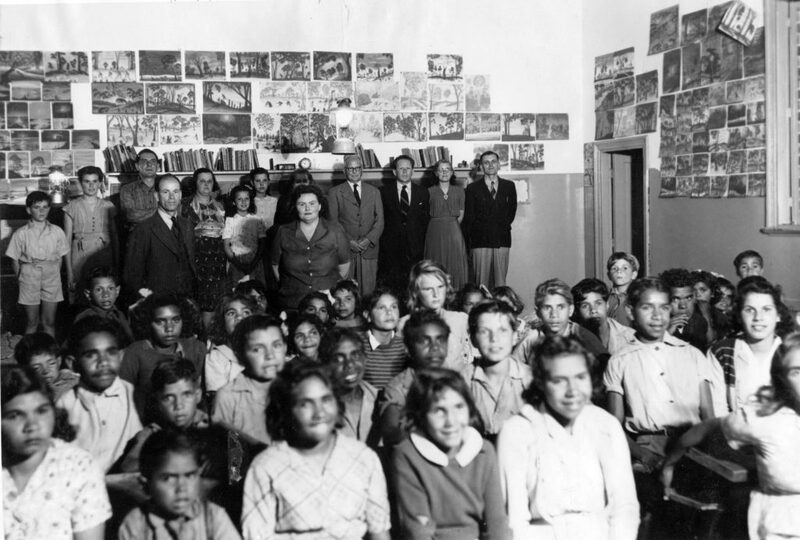 The children of Carrolup in their schoolroom with the White family and visitors from Katanning. Photographer: Noelene White, late 1948 or early 1949. Noel & Lily White Collection. 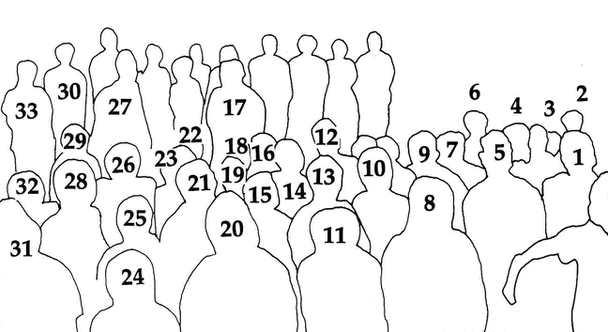 (1) Edith Smith, (2) Johnny Smith, (3) Emily Bennett, (4) Revel Cooper, (5) Reynold Hart, (6) unknown, (7) Mervyn Smith, (8) Vera Wallam, (9) Parnell Dempster, (10) Ross Jones, (11) Tilly Wallam, (12) Janine Bennell, (13) Keith Indich, (14) Marlene Mead, (15) Philip Jackson, (16) Joyce Colbung, (17) Lily White, (18) Alice Mead, (19) Margaret Bennell, (20) Shirley Wallam, (21) John Cuttabut, (22) Bessie Smith, (23) Inas Smith, (24) Godfrey Stack, (25) Lindsay Wallam, (26) Elizabeth Indich, (27) Noel White, (28) Milton Jackson, (29) Brian Culbong, (30) Janette White, (31) Dulcie Penny, (32) Syd Jackson, (33) Ross White. Photo: Noelene White, late 1948/early 1949, on the occasion of visitors from Katanning. Source: Stanton, J.E. 1992 Nyungar Landscapes: Aboriginal Artists of the South-West: the heritage of Carrolup, Western Australia. Perth: Berndt Museum of Anthropology, Occasional Paper No. 3; p. 14. When I first saw the above photo in Noelene White’s album, way back in late 1985, I recognised, immediately, its significance. For not only was it a photo that Noelene had taken, but it was also a photo that encapsulated the treasure trove that is the legacy of the child artists of Carrolup. This is a very personal journey, a reflective examination of how, and why, I embarked on this course. I did not seek it out. It was the Marribank Community (formerly Carrolup) who asked me to become involved, all that time ago, back in 1985. When I saw Noelene’s photo, I was already six months in to the Carrolup Project, as we called it. I had already been working for the Berndt Museum (it was called the Anthropology Research Museum back then) for seven years. At the time I was fully preoccupied with my earlier long-term research in the North-Eastern Goldfields, working at Mt Margaret Mission, as it was then, as part of my PhD in Anthropology. I was not writing about the people who lived there, but I was trying—within my disciplinary training—to understand just how my friends there were coping with the enormous changes that were encircling them. Changes about Aboriginal administration, community control—and the rest. I had also started working in the Kimberley, just before I went to Marribank/Carrolup for the first time. But when I saw this particular photo, it spoke volumes to me about the events at Carrolup back in the late 1940s. I borrowed Noelene’s album (it had been her father’s) to copy the images back at the Museum. In those days, of course, the word ‘digital’ had not been invented, there were no digital cameras, scanners, nor personal computers, even. So I copied the photos on film. I had a giant print made of this photo, and framed, which I hung in the offices of the Marribank Family Centre. This is when the Baptist Church was running the settlement, as a respite centre for families under stress. Pat Nunn was the resident Social Worker; I had known Pat from before, when she was a student of Anthropology at The University of Western Australia. Every visitor to her office saw this photograph and, over time, we were able to get the names of virtually every child. Some names are spelt differently in different documents. 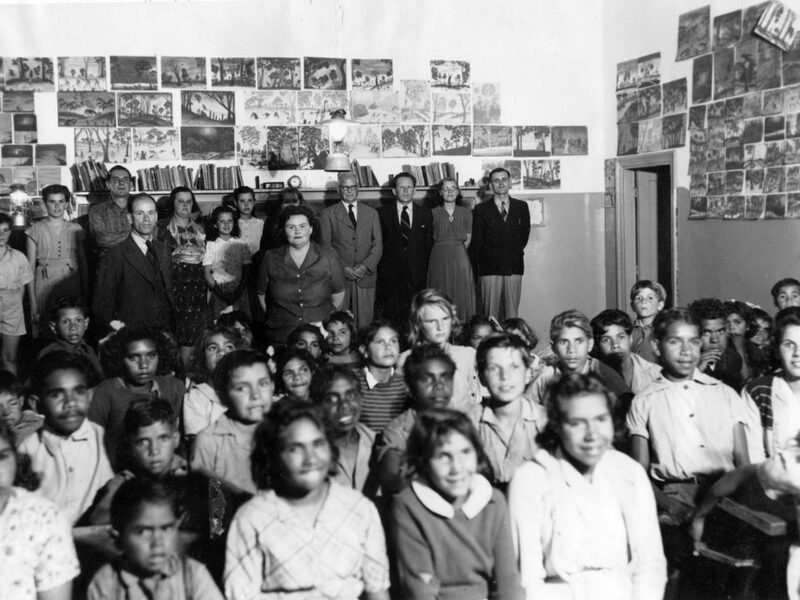 It’s a striking inversion: in so many other cases of historical photographs, the identities of the wedjelas, the white people, are recorded, but rarely the names of Aboriginal people. And so it came to be, that as part of the Carrolup Project, I mounted the first exhibition of Carrolup child art in 39 years, Nyungar Landscapes, at the Lawrence Wilson Art Gallery at the University. It travelled around Australia for the next eight years, at that time the longest-travelling national exhibition in the country. It was hung at Bunbury and Geraldton twice; a hitherto unknown experience. This photograph travelled with Nyungar Landscapes, along with its key. The key given here is an amended version of the original identification obtained by Pat Nunn. I remember the opening at UWA, when a community member was so taken with the photograph that she wanted it for her home. We couldn’t do that, of course, as it was all going on tour. But I did have 1,000 A4 copies of the photograph printed for free distribution to community members, and other gallery visitors. Later, we had to have another 2,000 copies printed. Everybody wanted a copy.